There is no better place to explore the benefits of IoT than a campus full of people willing to learn and embrace new things. Many campuses face problems that have so far been hard to track, address and fix. Some of them, like security of information have only increased over the years with the technology advancements. Some problems are smaller, like finding a parking spot, yet the solutions are often hard to find. However, with the presence of the Internet of Things on campuses could potentially change that. Energy saving, for one, is a real possibility with the help of IoT. When it comes to the campus, IoT-enabled technologies can let students know when their laundry is washed, track traffic patterns to plan sidewalk construction, track an athlete’s behavior and progress and monitor environmental factors for optimal training. This also means that the staff can control electricity, lighting and plumbing to prevent issues and deal with problems on time, not when they occur. In the classroom, IoT can track how emotions affect learning, study the posture of students, give us insights into how biological factors affect emotions, and improve safety and ease of life on campus. There are some concerns, however, like privacy, number of the devices involved or bandwidth demands, but IoT is still evolving and at this point the benefits far outweigh doubts. The IoT will continue to grow in the future, with one report predicting tens of billions of devices will be connected by 2020. 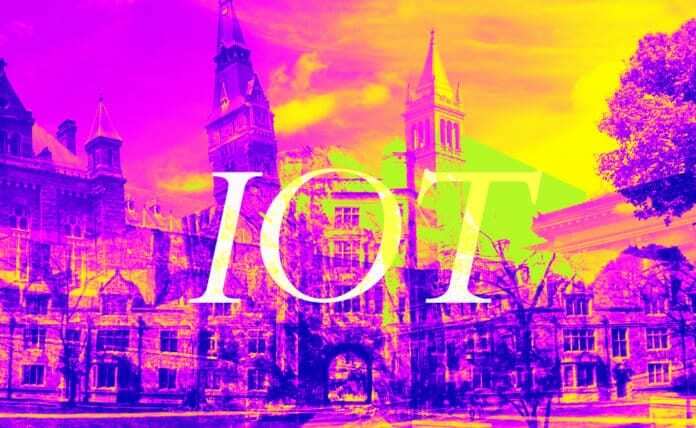 College campuses are using IoT for functions such as automated controls, saving institutions lots of money on heating and cooling budgets. Operators are able to remotely control hundreds of buildings’ systems with an automation system. Using IoT technology, electricity, lighting, plumbing, ventilation, and air-conditioning systems can all be controlled and monitored from one building. Schools have implemented functions that enable students to lock and unlock their residence doors using a smartphone app. College stadiums are using this kind of technology to monitor everything from noise levels, to leaky plumbing, to providing information on parking and bathroom availability on smartphones. IoT is also helping with academic matters. “Projects are underway testing out technology such as automated grading systems, and apps that notify professors which students are struggling with the material. There are apps that can notify students about upcoming assignments that are due, and even offering suggestions about events they might like to attend,” writes Jeffrey Bryant, educator at Boomessays and Essayroo. Students may someday be able to use technology similar to Disney’s magic bands to sign in at a final exam. Printers at Carnegie Mellon University have developed an app allowing people to link printers and projectors by simply snapping a photo of the device. There have even been trials recently at the University of Southern California to help personalize and enhance student experiences based on physiological data. Of course with all this innovative technology come concerns and attempts to protect people’s privacy. Most evolving technologies come with an element of risk, and IoT technologies are no exception. Some companies that create and implement this technology seem to lack focus on ensuring the massive amount of data moving in these systems is properly secured. Major interruptions occurred at one university as a result of more than five thousand discrete systems making hundreds of DNS lookups on their network every fifteen minutes. Each of these lookups sent information to the device requesting. A botnet spread from device to device, due to poor passwords, and took control of devices, including vending machines. Network engineers were temporarily locked out of more than five thousand systems. Many devices with cameras and listening capability are vulnerable to becoming accessed remotely, this includes anything from your laptop to your child’s talking doll. The IoT will only become more pervasive as time goes on, so it’s important to prepare your school for this technology. It’s better to be proactive rather than reactive when dealing with changes brought about by the IoT. Establish a policy for your campus that includes a definition of who may introduce devices to your network, which devices and apps are allowed, which websites and cloud services may be used by students and faculty for academics, and how data will be stored and protected. Strengthening security is also crucial, since the litany of new devices becoming connected to your network are all potential access points for cybercriminals. In October 2016 hackers used over one hundred thousand compromised devices to carry out DDoS attacks on companies such as Amazon. Consider investing in monitoring tools that can track who is connecting to your systems and what they are accessing. “You can avoid a lot of headaches and unfortunate situations by educating faculty and students about security awareness. If the users at your college are informed about taking proper security measures with their devices, your network will be more safe and secure overall,” advises James Montgomery, teacher at StateofWriting and Academized. Long-term implications related to the Internet of Things implemented in higher education are yet unclear, but the schools can prepare to be open to communication with businesses and IT companies to create best strategies for implementing IoT and maintaining it further, meeting the student demands and growing with the evolution of IoT. There is no better place to explore the benefits of IoT than a campus full of people willing to learn and embrace new things. Written by Grace Carter, editor at UK Writings.